There’s so many different “banh” in Vietnamese cuisine (banh day and banh bot loc to name a few) that even we get confused. But it’s reflection of not only the diversity of the cuisine, but of the culture and country itself, with each region seemingly having it’s own special banh to call it’s own. 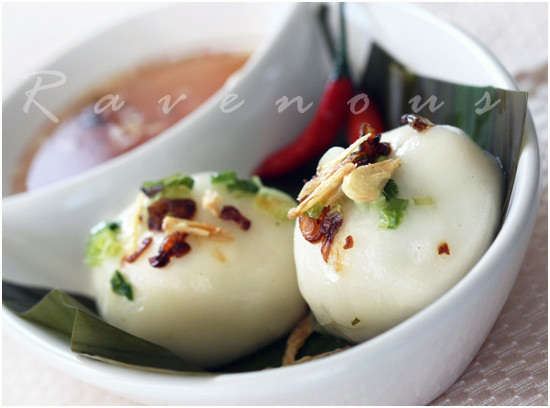 Banh it tran is a sticky rice dumpling originating in the central provinces of Vietnam. There are two major types of banh it–banh it tran is a savory rice dumpling filled with mung beans, pork, and shrimp and banh it la gai, a pyramidal shaped sweet dark green rice dumpling flavored by la gai (ramie leaf) and filled with sweetened mung bean and coconut and wrapped in banana leaves. Tran can mean bare/naked…so perhaps since banh it tran isn’t wrapped in banana leaves, that’s where it got it’s name? Banh it tran is often served at family celebrations in Vietnam, but one often find it as street food as well. In America, you often find these wrapped in styrofoam trays in Vietnamese delis, but it’s also really simple to make your own. Marinate the shrimp with 1 ts fish sauce, sugar, pepper and set aside for about 20 mins. Marinate the pork with 1 ts fish sauce, sugar, pepper, and dark soy sauce also for about the same time. In a large pan at medium high heat, saute the pork belly first. No oil is needed here as there’s plenty of fat in the belly. When it’s about 1/2 way done, add the shrimp. Saute until both are done and set aside. You either steam or boil the mung beans. We prefer steaming it since we don’t like to stand in front of a pot and stirring (use only enough water just to cover the beans). Steam mung beans until you can easily smash the grain with your fingers. The longer you soak in water, the quicker it will steam–if overnight about 15 minutes. When done, transfer to bowl or mortar and lightly smash. Now in mixing bowl, incorporate the crushed mung beans, shrimp and pork together. Allow to cool and form small balls, about quarter size and set aside. In mixing bowl, combine glutinous rice flour with salt and mix. Add the water, and work it into a pliable play dough like texture. Be patient–it’ll come together! Heat about 3 tbs of cooking oil and add scallions. Turn off heat and set aside. Pinch off dough and roll into golf ball size and flatten into a disk. Add the ball of filling in the center and fold over the edges and roll gently, sealing it. You can keep a small bowl of water on hand and using your wet fingers seal off any cracks. Lightly brush a bit of cooking oil on the banana leaves/foil and place the banh it tran on. Do not overcrowd the steamer and steam for about 8 minutes, until dough is opaque. Do not over steam as it will be flat. Remove and place in cold water bath to stop the cooking and remove the foil/banana leaf. Drain in colander and then place bowl. Add about 1 tbs of scallion oil or so and work it around so that the banh it tran do not stick together. Top with additional fried shallots and serve with nuoc mam cham, pickled carrots and daikon, and chile pepper. 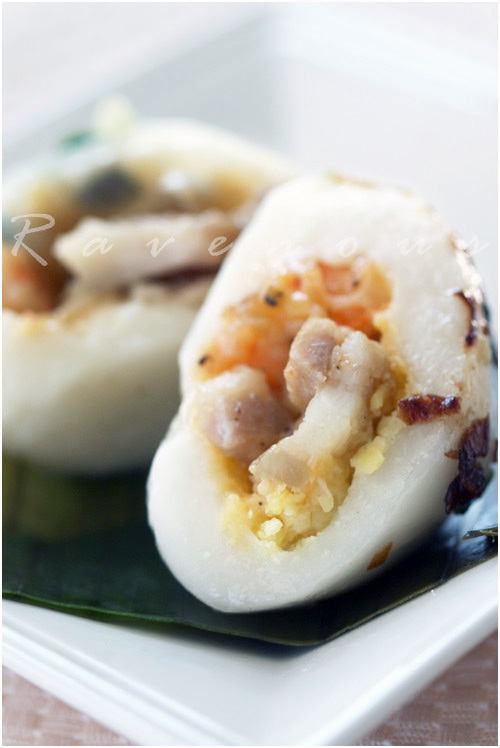 The texture of the sticky rice dumpling is akin to mochi, but the savory mung bean, pork belly, and shrimp filling makes this dumpling oh-so-good. Dipped in the nuoc mam cham and crunch of the pickled carrots and daikon, banh it tran ranks up there as one of our favorite “banh”! Your sticky rice dumplings are killing me! I want some I want some, now my mouth can't stop watering. But thanks for sharing. Scrumptious! KennyT: thank you! banh it is it! I'm totally intrigued by these. I've never had them. Do you know of any places that make good ones in NY? I'd like to taste one done right before I attempt to make it. Jess: hmm..NYC has such a paltry selection of good Vietnamese food and most of the restaurant's menu blend together..can't recall this being in anyone but we'll keep on thinking. 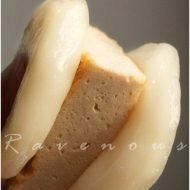 You've had mochi before right? Imagine that it's a savory type with shrimp/pork/mung bean filling. No way!!! You guys are awesome, some of my favorite memorable food items. Banh It Tran is great and everyone in my family loves this. I'll tell you how it turns out, will be making it this weekend. Delicious sounding rice dumpling. I made similar one with palm sugar inside it. In Indonesia they call it "klepon". omg looks sooo good! i love banh it! thanks for sharing. i have become a new follower of your blog!!!! David: Definitely take some photos and blog about it! We'll post it on our site. 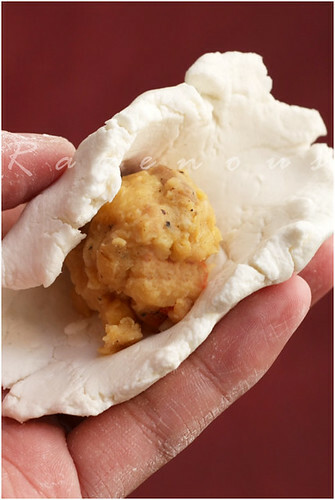 Elra: Sticky rice flour is often used for dumplings and seen in many parts of Asia. We're going to use this to try to make mochi. Anhesty: Thanks for commenting and reading! We hope you comment more often! You've done it again! I drooled on my keyboard. Thanks, guys. Gastronomer: We should have a blogger's Thanksgiving potluck in addition to that bakesale..what do you think? My mom used to make these! 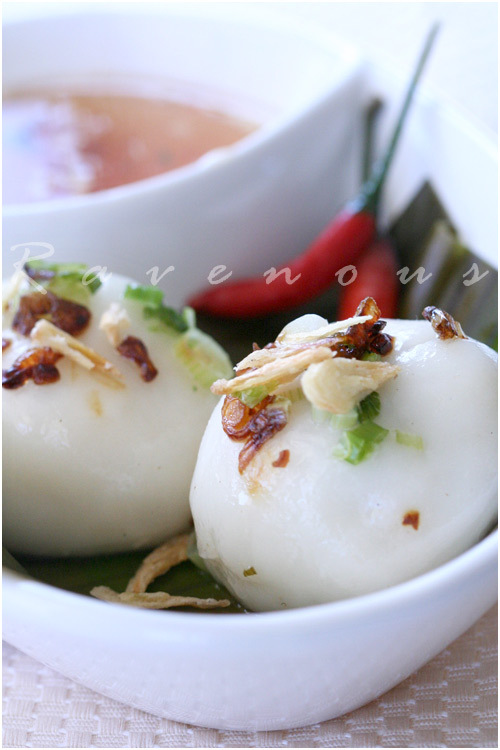 I never knew the name of this rice dumpling, but I love them! Fresh Local and Best: Glad Banh It Tran can bring back some good memories! I have never made bahn at home. So tempted to try after reading this post. gorgeous photos as always! oh my mouth is watering. I haven't had this dish for so long. I've never made it before. My aunt makes the best with the shrimp filling and the veggie version with mung beans. I want to eat my computer screen. Man, someone has to invent a smell-o-vision. Jackie: You can definitely make veggie versions of things. Mushrooms/chestnuts would be great too! These dumplings look absolutely scrumptious! I need to make those for sure! Wow; these dumplings look delish..Congrats on your foodbuzz fried halloumi cheest toast…so happy for you…have a great time in cali!!! 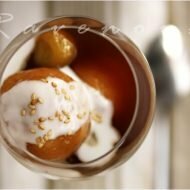 5 star foodie: Thank you! Jessica: Let us know when you're in town again, we'll gladly explore Little Saigon with you guys! Healthy Apple: Thank you!! We're shock, honored and soooo excited! This looks so good. I haven't tried it before, but I love anything made with glutinous rice flour. I need to try to make this or find it in a Vietnamese deli. YUM! I grew up in various places in south east asia so I just love anything made with rice flour. I really need to learn how to cook with it. 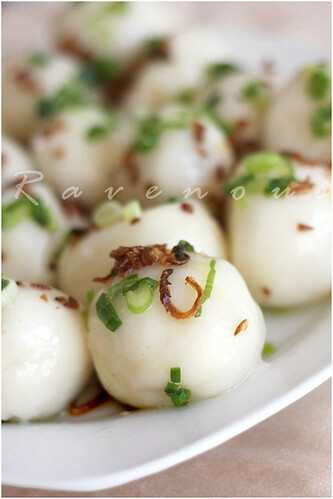 kirbie: if you love glutinous rice flour, this dumpling along with banh day will be right up your alley! So interesting to learn about this dumplings! I would love to try some of these, they look wonderfully tasty. Thank you for showcasing wonderful Viet treats/snacks. Tuty: Thanks for taking the time to comment! We love to make and learn about Vietnamese cuisine as well! Great post! I was wondering if the glutenous rice powder you mention here is difference form the G.Rice Flour used in your Bahn Day post. illusion of doing: Thanks! Glutinous rice flour is the same for both the banh it tran and banh day. They look very pretty. 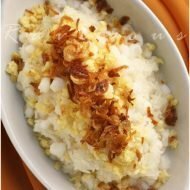 I wanted to try something savory with glutinous rice and this is one of the recipes that I wanted to try. Divina Pe: This is similar to the mochi you just made! Never seen this before.. Looks great! Did u guys see that huge party tray of Banh It Tran/Banh bot loc that I made for thanksgiving? I used your recipe and it turned out great! David: You must have been cooking like made for the holidays…great job! I’m a big fan of Asian food, especially the cuisine of Vietnam. I had these for the first time a few weeks ago from a local VN deli. Wanting to find out more, I looked through your great site, and sure enough, there they were. I followed your recipe, save adding a bit of regular rice flour and some tapioca starch, (as my dough was too thin initially and i had no more sticky rice flour), but even with that deviation, they came out FANTASTIC! You might want to give readers a clue as to quantities a recipe will produce, because I still have a LOT of dough and filling! You have a fantastic resource here, thanks for the work, don’t stop! I had these at a local VN deli a few weeks past, and wanted to find out more. I checked your great site and sure enough, there they were. I followed the recipe except I was short of sticky rice flour, so I added some tapioca starch and regular rice flour, and even with that deviation, they came out GREAT! I would suggest you give an indication of the amount a recipe makes, as I have LOT, of ingredients for many more dumplings. Anyway i think this is a great site, so keep up the work! so glad the banh it tran worked out for you! post photos on our fb page if you can! by the way, your metal work is amazing!! especially those chandeliers! Do u know if these can be made ahead and freeze it? Then steam it wheel ready to eat? we never tried it, but doesn’t hurt to make a batch and reserve a few to test.